during the Spring Spectacular III. Wayne, IL - June 17, 2015 - In its usual fashion, Chicago's summer weather has proven unpredictable, even coining the term "Chicago Apocalypse" with over six inches of rainfall on Monday. The sirens blared throughout the city neighborhoods while funnel clouds and tornado watches marked the radar; however, the skies turned blue Tuesday, just long enough to usher in the third week of the Spring Spectacular III with the kick-off of its WCHR-week and Hunter Derby Day. The rainfall returned to the "Windy City" Wednesday morning as the Open Jumper divisions set the stage for the final week of jumper competition at the Lamplight Equestrian Center. The torrential downpour did not dampen the competition. Ryan Sassmannshausen of Kinvarra Farm in St. Charles, Illinois, took the victory during the morning's $2,500 1.30m Open Jumpers. He rode Basho, owned by Allana Featherstone of London, Ontario, to the first place finish in 30.330 seconds, beating out a field of 17 horse and rider combinations. "It was definitely raining hard this morning, but I actually like it better like that," Sassmannshausen said. "I think the footing gets even better with the water, it has a little more sink and gives us more power off the ground." Sassmannshausen was able to navigate the two tracks efficiently, finding everything at stride and leaving out strides during the jump-off to take the lead. He has only been riding Basho for about three weeks. Sassmannshausen attributes their win in the Open Jumpers to the reliability he feels with the horse. "He was great out there for me today. He doesn't look or feel like he is going very fast, but he has one of the biggest strides I have ever been on," Sassmannshausen iterated. "I left out two strides to the second obstacle, and we were able to take the inside track in the rollback." Sassmannshausen continued, "He is the first horse I have ridden that has allowed for me to feel so reliable at that height. I have always had to ride defensively, and this is one of the first horses where I can focus on going for the win. He is pretty rock solid and ready to go." Ten competitors mastered Anderson Lima's opening track, but none were able to match Sassmannshausen's blazing time. Lisa Goldman, of Hawthorn Woods, Ill., and Hindsight posted a clean jump-off time of 31.284 seconds for the second place, while Steve Schaefer and Zanziboy, owned by Matt Yeterian of Barrington Hills, Ill., took the third place finish. During the $2,500 1.40m Open Jumpers, Tracy Fenney debuted new mount MTM Dumbledorf, owned by MTM Farms of Flower Mound, Texas. Fenney set the lead early in the class with MTM Grand Slam, blazing the trail in 35.498 seconds. She returned with Dumbledorf to show him in their first class together, shaving her previous time by nearly two seconds, to take over the victory in 33.738 seconds. Fellow Texan Trapp O'Neal was the only other rider of the class to master the first round course, earning the third place with his time of 35.519 seconds aboard Quilona Z, owned by Carolyn M. Elsey of Hockley, Texas. The 8-year-old only joined the MTM Farm family three days ago after finishing quarantine. Michael McCormick and Derek Peterson bought him together, and Fenney, who has only ridden him twice, wanted to see what he was capable of in the Grand Prix Ring. "We are really excited about him," Fenney said. "It was really fun out there. He is super light, and super willing to do anything. I tried to do a little in the jump-off and he made that look easy. We are aiming to compete in the Welcome Stake tomorrow, and then we will go from there." Although, upon importation, many horse's experience name changes, Dumbledorf seems to have stuck to the big gelding, who has proven himself a ham in the barn. "He is really kind, he likes to lick your hand and put his head under your head. His name suits him, and we think it is going to stick," Fenney laughed. The jumper action will continue in the Grand Prix Ring tomorrow when the $20,000 Open Welcome Stake, sponsored by The Novak Family, will take center stage. Riders will also have the opportunity to show in the Young Jumper Championship classes, with the unique chance to compete without entry fees. Maria Rasmussen and Corporate swept the opening day of the First Year Green Working Hunters at the Spring Spectacular III. Wayne, IL - June 17, 2015 - A rainy wedding day is a symbol of good fortune, and if that superstition holds true for horse shows as well, then the start of the week's competition at the Showplace Spring Spectacular III was looking very lucky for a few select hunter horses and riders. Riding the courses in raincoats, some were able to find success in spite of the dreary weather, with one pair winning six of their seven classes of the day. The First Year Green horses, with the fences set at the 3'3" height, were the first to navigate their ways around the course in spite of the pouring rain. Today's competition included a hunter round, handy round, and the under saddle, none of which were any match for Ashley Netzky's Corporate with Maria Rasmussen aboard. The pair has been showing strongly over the first two weeks of the series, and continued that trend today, sweeping the first half of the division by winning the top prize in all three classes. Of her handy round, the victor noted that it was the hand gallop approach to one of the birch oxers that the pair did especially well. "When I asked for the hand gallop he just exploded," Rasmussen stated. "He puts so much effort into his jump," Rasmussen praised of her mount, "and he always has a great expression in the ring. He wants to win." Second to Corporate in both the fences and the handy rounds was Brenda Christenson's All In, ridden by Tamara Provost. All In, known as "Victor" in the barn, is a 7-year-old bay gelding that was purchased with the intention of competing in the Amateur Adult divisions, and is prepping for his future career in the First Year Green Working Hunter division. "He is so willing, straight-forward and has a great jump," rider Provost complimented. "We have been enjoying the beautiful facility with him while we are here." Belynda Bond and Eileen Fontaine's Benicio also put in a couple of strong performances in front of the judges, earning two third place finishes. The first came in the over fences class, and the pair duplicated their efforts over the handy course. Prior to their threefold wins, Rasmussen and Corporate had impressively taken another three top finishes in the Conformation Hunters, which was a combined class of both the Green and Regular Conformation horses. The duo won the model, handy and under saddle, only falling short of first place in the first over fences portion of the division. Also showcasing themselves well was the horse and rider partners of Cucinelli and Rush Weeden. Cucinelli, owned by Glory Days Farm, LLC, carried Weeden to the second-place finish in all four classes. Raising the jumps a few inches, the Second Year Green division followed, with the rain finally starting to let up. Impressing the judges in the fences and handy rounds was Russell Frey in the irons aboard Debbie McIntyre's grey Cavalli. The pair mastered the hunter track well enough, combined with a third place finish in the hack, to take the lead in the division headed into tomorrow's competition. Holding a consistent pace and finishing second in each of the day's three classes was Laura Stern and her own Harrison. With the points close between the competitors, it will come down to Thursday's deciding results to determine the champion. Next on the agenda was the Performance 3'6" Working Hunter division, and 17 entries battled it out over two tracks of obstacles hoping to catch the attention of the judges. In the end two riders and their mounts had more promising starts to the division than the rest. Tiffany Hammack and Cassie Berke's Ducati claimed a first and second place finish, taking the lead headed into day two, with Rush Weeden following up closely behind with Amanda Williamson's Nairobi News. Weeden and Nairobi News trail by just one point, with first and third position finishes. Also performing well was Michael Bonham with the ride on Haley Mick's Capilano with strong second and fourth place finishes. Next door in Ring IV, the $1,000 USHJA Pre-Green Incentive Stake was underway, and although 17 other entries tried to stop her, Caitlyn Shiels and Natalie Alden's King of Hearts were able to ward off all the competition and claim the championship honors. It's been a successful two days for King of Hearts, as he was also crowned the victor in yesterday's $10,000 USHJA National Hunter Derby. Natalie Alden purchased King only a few short months ago at the conclusion of the Florida show circuit. The bay gelding transitioned to the hunter ring this year following a career as a jumper, and his easy way of going and large stride has certainly caught the attention of the judges. "He is a lovely horse with a great rhythm and adjustability, and it seems like every class he learns a little bit more," Caitlyn Shiels praised of him yesterday. 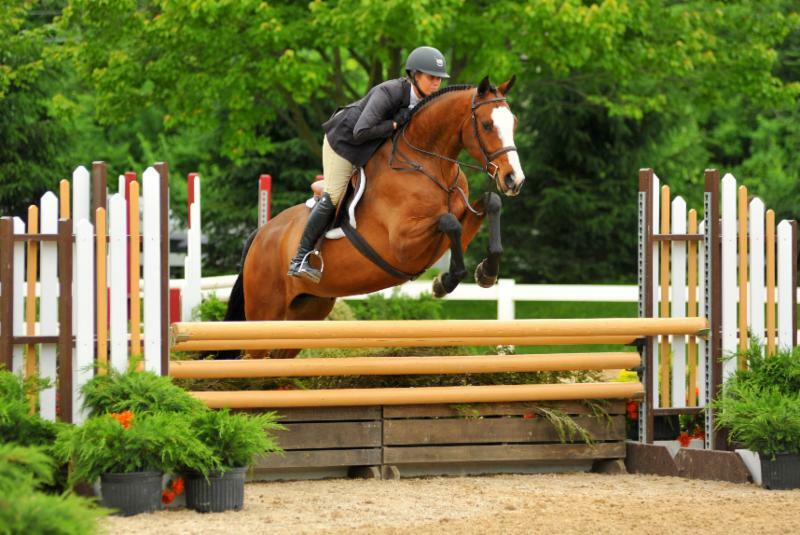 The pair plan to compete at the USHJA Pre-Green Incentive Finals in Kentucky in August, where they will battle it out with other qualifiers in the hopes of taking the top prize. Rounding out the top three was Bob Brawley on Brawley Farms, Inc.'s Caymus in reserve, and Hillary Johnson on Copper Fox LLC's Sorrento claiming the third position. The hunter action continues tomorrow at the Showplace Spring Spectacular III, with the professional divisions wrapping up, highlighted by the Pre-Green Hunter Challenge and the Open Hunter Classic, both sponsored by Meadowview Farm. The Grand Prix Ring will host the $20,000 Open Welcome Stake, sponsored by The Novak Family, and riders will also have the opportunity to show in the Young Jumper Championship classes with the unique chance to compete without entry fees. For more information please visit: http://www.showplaceproductions.com.